Train journeys along the Konkan route have been a lot more scenic with Vistadome, the luxury train coaches that the Central Railways introduced last year. 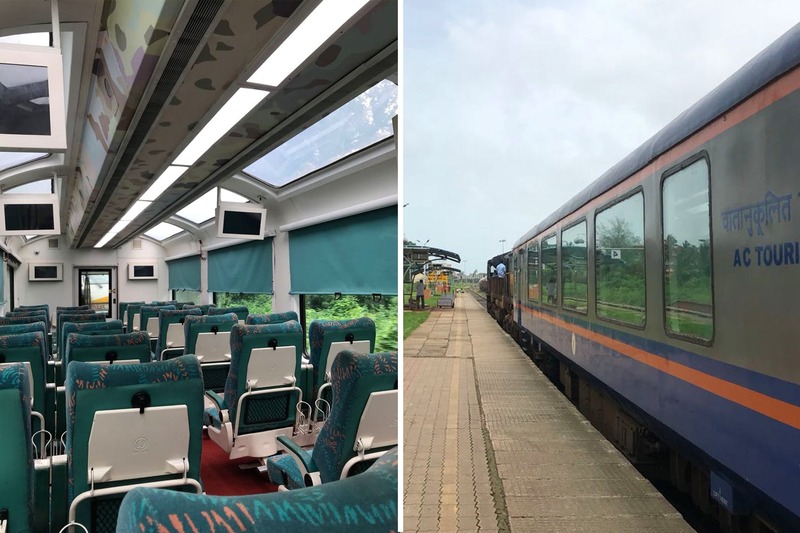 The Central Railways introduced a new set of coaches along the Konkan coast, one which have a glass ceiling and wide glass windows, giving passengers a spectacular, panoramic view of the the Western Ghats. We did a two-way journey this monsoon, and here's what we thought. Much like the Eurorail, which makes travelling along the European countryside a feast, these new glass-panelled trains also have auto-sliding doors, push-back seats, and LED lights. The train journey is about 11 hours-long, and having done it both ways, we recommend you definitely do the Mumbai to Goa route since the executive coach’s small pantry area will give amazing 180 degree views. Goa to Mumbai is great, too, but the views from the pantry area are blocked because the engine is upfront. The seats are super comfortable and make sure you sit on the right side of the train on your way to Goa as most waterfalls, open forests and hills come on this side. They're so deep into the forest, it's hard to get to these spots on foot and this is probably the best way to experience them. The sun roof was literally our most favourite part of the ride. Plenty of daylight and the big windows ensure the views aren’t restricted. The journey through Ratnagiri is the most scenic. Honestly, we'd actually compare it with any European train journey- it's comfortable, clean and the the views will make sure you don’t sleep. The fact that there's hardly any network means you can enjoy an unperturbed ride. Honestly, we were very surprised by whole experience. There was an attendant on board who helps with food, etc. and went out of his way to get coffee from a station and make it in the pantry since everyone was asking for it. Since it's kind of expensive (INR 2,230 one way), it's mostly empty and you get the space and the views to yourself. There are charging points next to each seat, and there's no WiFi (and it isn't needed either). They could have added a complementary meal in the package, but you have to buy your own food on board. Only tea is available on the train with some ready to eat snacks like Maggi. So yes, some coffee and more options would've been better. These coaches now, owing to the Railway’s monsoon schedule, only ply between Mumbai and Goa thrice a week as against its earlier everyday schedule. The Vistadome, attached to Dadar-Madgaon Jan Shatabdi Express, leaves Mumbai on Mondays, Thursdays and Saturdays, and returns from Madgaon on Tuesdays, Fridays, and Sundays.